Tidwell (January 14, 2019) – A chain reaction crash happened due to an air conditioning unit falling off a truck in the roadway. 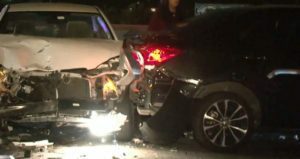 The series of car collisions occurred on Monday night at 11:00 p.m. in the northbound fast lane on Interstate 45 near Tidwell. When the first driver swerved to avoid hitting the A/C unit, the car swiped an off-duty officer’s vehicle. A third car tried to stop, but clipped the first vehicle involved in the crash. Three more vehicles tried to avoid hitting the A/C unit and the crash, but became part of the collision by hitting each other back-to-back. One woman was taken to the hospital with minor injuries. If you or a loved one were involved in car accident, it is important to contact a car accident attorney to help you evaluate your options. Call (713) 987-7111 or send us an email to discuss your car accident injury case.